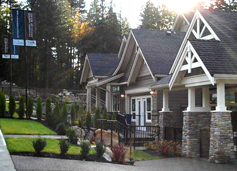 Birchwood Estates is Burke Mountain’s most exclusive new single-family luxury home development, featuring 30 custom-built executive houses at the top of Coast Meridian Avenue in Coquitlam. These 3, 4, and 5 bedroom open-concept executive homes are built on estate-sized private lots ranging in size from 8000 to 28,000 sq. feet. These are the largest lots on Burke Mountain, and this may be the last opportunity to buy lots this size in all of Coquitlam. When you buy with Wallmark homes, you will have the opportunity to work directly with an interior designer to customize every aspect of your new home – from flooring to granite to paint colour – all included in the purchase price. With Wallmark Homes, you can expect the highest quality craftsmanship and finishings throughout the homes. Birchwood Estates by Wallmark Homes is now SOLD OUT. Contact Rebecca Permack today to schedule your private showing and a tour of the Burke Mountain area. From 8,000 - 28,000 sq.ft.